I don’t usually look forward to Mondays (especially after spending a very exhausting though rewarding weekend organizing SQL Saturday Charlotte), but then today was different. Amir Netz had already spoiled my weekend by putting out a teaser on Power BI and I was actually waiting for Monday to come so that I could remind him of his promise. Custom visuals in the Power BI service and Desktop: The ability to upload and incorporate a custom visual, whether a broadly useful visual from our community gallery or a completely bespoke visual tailored for the needs of a single user, into the report and then share it with others. This is available in the Power BI service today, and in the Desktop next week. The Power BI visuals gallery: A community site (visuals.powerbi.com) that allows creators to upload new Power BI visuals and for users to browse, select and download those visuals. Power BI developer tools: With our developer tools every web developer can code, test and package new visuals directly in the Power BI service to be loaded to the gallery. You can read more on this in the official blog post here. Let me use this moment to give a quick intro to the Power BI visuals gallery and how you can use some of the community examples to enhance your visualizations. First of all, note that this functionality is only available in the Power BI service as of now and will be available in Power BI desktop next week. Also, the custom visuals can not be pinned to a dashboard as of now, but that feature should also be coming soon. That said, follow the steps below:- 1) Head over to https://app.powerbi.com/visuals and feel free to choose any of the awesome visualizations created by our community. For now, I am going to choose Hexbin Scatterplot (which was created by my colleague David Eldersveld and won the third prize in the Power BI custom viz contest– you might also want to check out his thoughts on Power BI Custom Visualization here) and KPI Indicator with status. 2) For each of the selected visuals, click on the visual icon and then you will be presented with the Download Visual window. Click on Download Visual button. 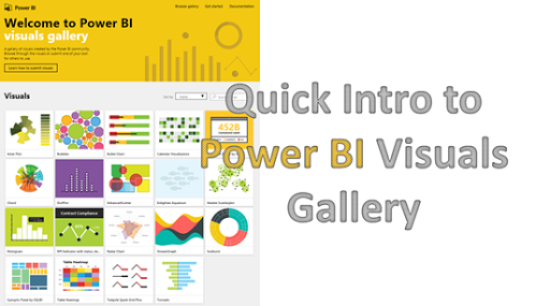 3) This will begin the download of your pbiviz files (power bi custom visualization files). Once the download is over, sign in to Power BI service and then open a new report. Click on the Ellipsis symbol (…) to import the two pbiviz files that you downloaded. 4) Now you can use those custom visualizations just like the existing ones. For e.g., I can create a hexbin scatter plot chart by selecting Sales Amount, Sales Quantity and Store name. Note how I change the default visualization to a regular scatterplot and then to a hexbin scatterplot. Also look at the benefits that a hexbin scatterplot gives over a regular scatterplot – you can easily see where the concentration is more, and you also have rug marks on your axis to show where the dots are. Feel free to explore the chart, you can watch how it works from the video in this link. 5) I added a regular bar chart for Sales Amount by Year on the bottom left to show the interactive features of the new charts. Then, I went ahead and added the Sales Amount and Sales Amount LY by Calendar Month and chose the KPI Indicator visual. Note how smoothly all the charts work with each other! 7) You can save this report and share with others now. When you share a report that contains a custom visualization, you may be greeted with a warping that the report contains custom visuals. Click on the Enable custom visuals button to see the report.